[2013.07.20] 长白头发是好事情？ - 财经 - ECO中文网 - Powered by Discuz! for its intensity, the subsequent recovery for its weakness. and they often get rid of new recruits because they are easier to sack. older workers were also booted out. Job losses among older workers have also been more than offset by falls in inactivity, reflecting forces that were already apparent before the crisis. They are also more attractive to employers than prior generations. Today’s 55- to 64-year-olds are the advance squad of the post-war baby-boomers who benefited from better education than their predecessors. Many will argue that older workers have done better at the expense of the young. there is no fixed “lump of labour”. young and old people are by and large not substitutes in the workplace. Young people always suffer in recessions. they have done better than other age groups. workers ...have been adversely affected by poor annuity rates when they convert their savings into regular income. THE recession of 2008-09 was remarkable in rich countries for its intensity, the subsequent recovery for its weakness. The labour market has also broken the rules, as new research from the OECD, a think-tank of mainly rich countries, shows in its annual Employment Outlook. 首句是省略的并列结构，补充完整为：The recession of 2008-09 was remarkable in rich countries for its intensity; the subsequent recovery was remarkable in rich countries for its weakness. But in previous episodes, such as the recessions of the 1970s, 1980s and 1990s, older workers were also booted out. During the financial crisis in 2008, and since, they have done better than other age groups. Why have older employees done so well? In the past early-retirement schemes provided by governments (in the mistaken belief that these would help young people) made it cheaper to push grey-haired workers out of the door. These have largely stopped. They are also more attractive to employers than prior generations. 1 THE recession of 2008-09 was remarkable in rich countries for its intensity, the subsequent recovery for its weakness. The labour market has also broken the rules, as new research from the OECD, a think-tank of mainly rich countries, shows in its annual Employment Outlook. 2 Young people always suffer in recessions. Employers stop hiring them; and they often get rid of new recruits because they are easier to sack. 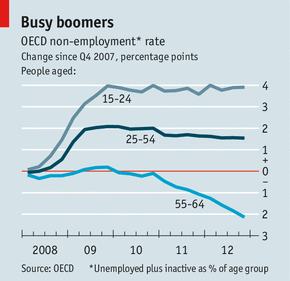 But in previous episodes, such as the recessions of the 1970s, 1980s and 1990s, older workers were also booted out. This time is different. During the financial crisis in 2008, and since, they have done better than other age groups. 3 The researchers focus on movements in “non-employment” as a share of the total population in three age groups between the final quarters of 2007 and 2012. This measure has the advantage of including not just unemployment, where people are looking for work, but also inactivity, where people are not seeking jobs. Whereas the average non-employment rate in the OECD has risen by four percentage points among young people and by one-and-a-half points among 25- to 54-year-olds, it has fallen by two points among the 55-64 age group (see chart). 4 Why have older employees done so well? In some southern European countries they benefit from job protection not afforded to younger workers, but that did not really help them in past recessions. What has changed, says Stefano Scarpetta, head of the OECD’s employment directorate, is that firms now bear the full costs of getting rid of older staff. In the past early-retirement schemes provided by governments (in the mistaken belief that these would help young people) made it cheaper to push grey-haired workers out of the door. These have largely stopped. 5 Job losses among older workers have also been more than offset by falls in inactivity, reflecting forces that were already apparent before the crisis. Older workers are healthier than they used to be and work is less physically demanding. They are also more attractive to employers than prior generations. Today’s 55- to 64-year-olds are the advance squad of the post-war baby-boomers who benefited from better education than their predecessors. 6 Older workers now have a sharper incentive to stay in employment because of the impact of the crisis on wealth. In Britain, for example, workers who rely on private pensions have been adversely affected by lower returns on their investments and by poor annuity rates when they convert their savings into regular income. 7 Many will argue that older workers have done better at the expense of the young. That view is wrongheaded. First, it is a fallacy that a job gained for one person is a job lost for another; there is no fixed “lump of labour”. And second, as the report shows, young and old people are by and large not substitutes in the workplace. They do different types of work in different types of occupation: younger people gravitate to IT firms, for example, whereas older folk tend to be employed in more traditional industries. There are plenty of things that should be done to help the young jobless, but shunting older workers out of the workplace is not one of them. 第二段 This time is different. GMT+8, 2019-4-21 04:55 , Processed in 0.086542 second(s), 28 queries .